Question: How do I decide what size will best suit my needs? Answer: If you mean size as far as length and width it's up to you. Just remember that the bigger the blanket, the more the weight is distributed. So if you get the smallest width most of the weight will be on you, but if you get one that is the full width of your bed, especially a queen or king bed, half that weight will be on the other side of the bed. Question: Do the beads separate? Answer: Yes all the beads are evenly distributed in each pockets. Question: Will the glass beads shatter and be unsafe? Answer: No, please don't worry. The glass beads are very tiny, natural and strong enough that won't be shatter. Question: How do you clean your weighted blanket? Answer: The fabrics and glass pellets used to make our weighted blankets are very durable. Viki Weighted Blankets are machine washable and you can dry it in a dryer. You can also dry them outside in the sun or inside (air dry). Question: Is there any guarantees with this product ? Answer: We provided unconditional return and refund after you receipt the item within 30 days. If the blanket doesn't meet your satisfaction, please contact with us immediately, we are glad to help you deal with your problem. Question: Does this blanket make any noise at all when the pellets shift? I have auditory sensitivities. Answer: No, it doesn't. We have updated the progress to fix the problem of glass beads move massive around inside the blanket, which also will not make sounds when the pellets moves. Question: Where is this blanket made? Answer: The blanket is made in China. Question: Does the blanket suitable for everyone? Answer: Some people are not recommended to use the weighted blanket. Please do not use it for pregnant women, children under 5 years old. CHOOSING A WEIGHT&SIZE: The blanket weight should be chosen according to your individual weight. A weighted blanket engineered to be 10% of your body weight to naturally reduce stress and increase relaxation. It is not recommend to choose oversize blanket because blankets cover the top of the bed only, and should be sized to fit the body, and not the bed. A weighted blanket that is too large will slide off the bed all night and be heavy to pull back up. PREMIUM MATERIALS : Viki Weighted Blanket is made of 100% natural 300TCS cotton, which makes the blanket softer and more exquisite. To prevent the glass beads leakage, we add two layer cotton fabric inside, which is thin and would not make it hot. ENVIRONMENTAL FILLING: Our blanket is filled with non toxic commercial grade homo natural glass beads which is more tiny and smooth. We have updated our progress and sewed the filling in smaller squares which make weight is evenly distributed across the blanket so you feel the same deep pressure no matter what part of the blanket is touching you. 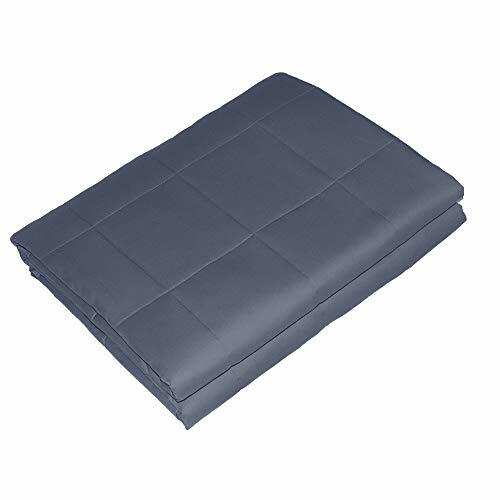 CARE INSTRODUCTION: The weighted inner blanket is machine-washable on a low, gentle setting. This product is not suitable for dry cleaning or for being used in a clothes dryer as it damages the blanket and reduce its lifespan. Recommend hang dry the blanket to extend the life span of your blanket. SATISFACTION GUARANTEE: We have our own factory and we check the quality step and step during the manufacturing, so we are confidence of our quality. Please feel free to contact us if the blanket doesn't meet your satisfaction. If you have any questions about this product by Viki, contact us by completing and submitting the form below. If you are looking for a specif part number, please include it with your message.